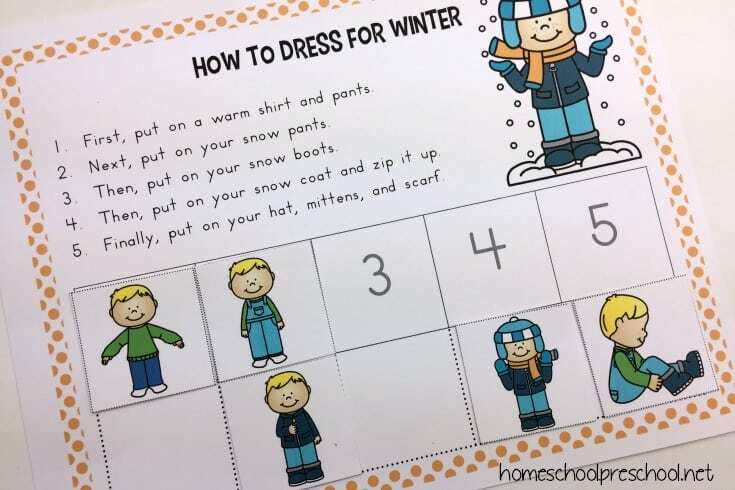 This How to Dress for Winter sequencing for preschoolers activity pack is a great visual to help little ones practice independence as they get dressed this winter. This sequencing activity for preschoolers is perfect for practicing the order of things. It can be used as a whole group activity or done independently. You can also add the image cards to a visual board for special needs children. Preschoolers can have tons of fun with these sequencing activities. Talk about the “why” behind the “how to dress for winter” sequence. Why don’t we put our mittens on before our boots? Why don’t we put our boots on before our snow pants? I bet you can make up some really silly scenarios to help your preschoolers see the logic behind the sequence. This pack of sequencing cards and activities contains story cards, image cards, story/image cards, a sequencing mat, and a writing page. Each of these can be used individually, or they can be used as a whole set within a lesson. I like to start out by introducing the object cards. Help your child name each picture. Then, see if they can guess what order to put the items on when they get dressed to go outside. Next, try the story/image cards. There are five of these. They feature a sequence step and an image. See if your preschoolers can put them in order. Then, read the sentences and see if they want to make any changes to their sequence. Finally, I like to use the story cards with the image cards. I read the story cards aloud and have students put the image cards in order as I read each clothing item. My favorite part of this pack is the sequencing mat. I cut out the five sequencing cards, and put them in random order in the bottom row of boxes. Then, read (or have your kids read) the story and put the sequencing cards in order. Don’t miss these free printable nursery rhyme sequencing cards is perfect for preschool and kindergarten kids. Set includes posters, sequencing cards, and more! 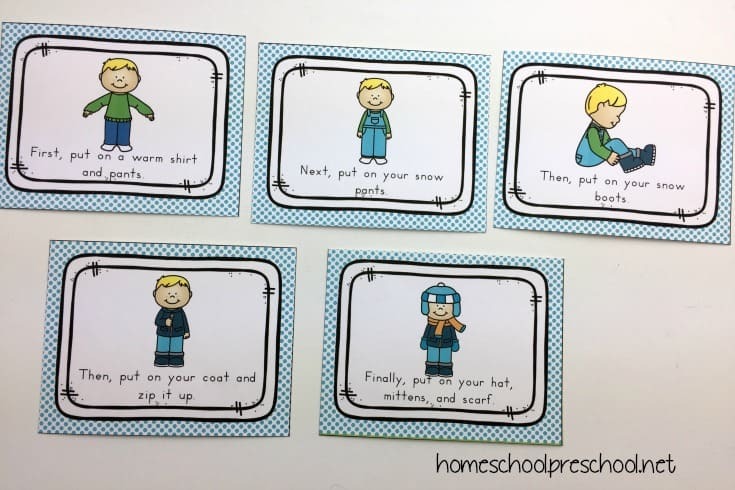 This winter, preschoolers can practice sequencing with this set of “how to build a snowman” sequence card printables. They’re perfect for your winter lessons. Kids can learn the order of things with these 3 step sequencing puzzles. Each puzzle features activities your preschoolers will encounter in their daily lives. 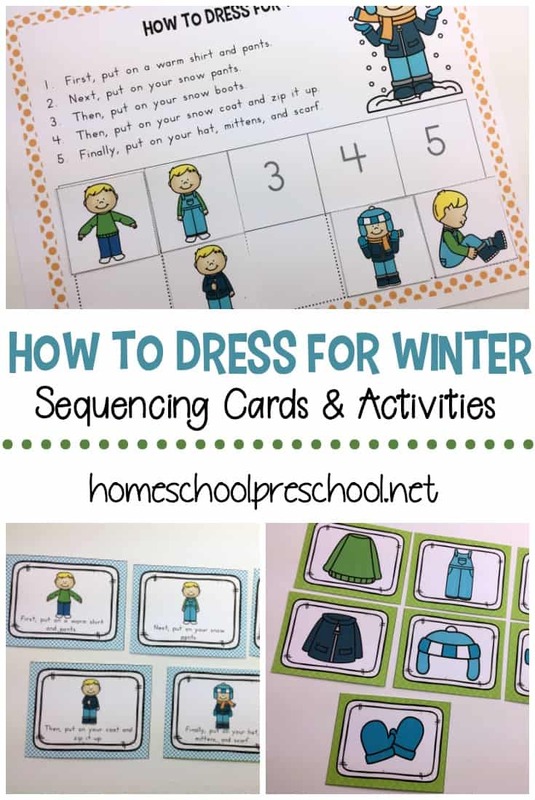 This pack of winter sequencing cards for preschoolers is only available to my readers. Click the button below, enter your information, and download your printables. I love this idea. I will be saving it for later because I do have a preschooler! Thank you for sharing at #OMHGWW and hope to see you next week!